Interested in becoming a music conductor? Conductors direct musical performances by orchestras and choral groups. In order to become a conductor, you will need music education, experiential education like an apprenticeship or internship, and practical experience. Here are tips on how to gain the necessary skills and experience to successfully search for and land a conducting job. Conductors need to have a solid foundation in music theory. Typically this knowledge is derived from private music lessons followed by a concentration in musical studies at the college or conservatory level. Conductors must understand the dynamics and nuances of a broad range of string, woodwind, brass and percussion instruments. Aspiring conductors should learn to play a variety of these instruments to develop a concrete feel for their character. Conductors should develop the ability to quickly read musical notation and convey precise instructions to members of the orchestra through gestures and facial expressions. They must respond with cues to band members to correct any problems with pitch or timing as they occur. Therefore, the cognitive/perceptual ability to quickly process sound and convey instructions is essential for this profession. Conductors must have the creativity to interpret traditional musical pieces in novel and interesting ways. 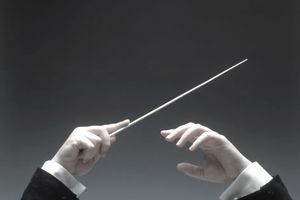 Conductors must be effective leaders and managers since they recruit, train, evaluate and discipline orchestra members. Organizational skills are important since they structure rehearsals. Aspiring conductors must lay the foundation for their career as a student. Students can benefit from taking hands-on conducting classes through the music department at their college. They can help to organize and conduct youth orchestras in their area. Upperclass students can offer to assist the faculty who are conducting campus orchestras. Students can organize their own musical groups and conduct the pieces that those groups will perform. Individuals with a talent for composition can arrange for groups to perform their pieces and serve as a conductor for their own work. Students can work during the summer at specialty music camps and help to conduct the performances of campers. Conductors will typically start their career working with a smaller local chamber, youth or community orchestras. Some individuals start as interns and then move to music assistants or assistant conductors prior to landing a job as a conductor. Aspiring conductors should ask college career/alumni offices, faculty, past music teachers and internship supervisors for introductions to directors and conductors for various music groups. These contacts can be approached for information and advice. Candidates can ask to shadow these professionals during rehearsals to solidify relationships. Candidates for conducting positions will often be required to prepare a DVD sampling of their work conducting performances and rehearsals. You can ask these networking contacts to review your work. Hopefully, these professionals will develop an appreciation for the quality of your conducting skills and refer you to other professionals who are hiring. Orchestras and other music groups will rely heavily on conducting DVDs and auditions when selecting conductors and assistants. Final candidates will often be asked to perform with the orchestra that they hope to conduct to demonstrate their skills. As part of traditional interviews, candidates must also showcase the strong communication and interpersonal skills required to teach and lead music groups. If a conductor isn't the job for you, there are many other job titles in the music field. Here's a sampling.